I love finding new outdoor games! I like to encourage my nieces and nephews to play outside rather then sit in front of the tv all the time. Also, I like to be outside with my husband (as long as there is no snow). I received the Ring Stix Lite to test out, and I was so excited! Though, my husband wasn't home so I had to test this alone at first. Which was completely ok with me. In my package I received four stix and two rings. The great part about this is. 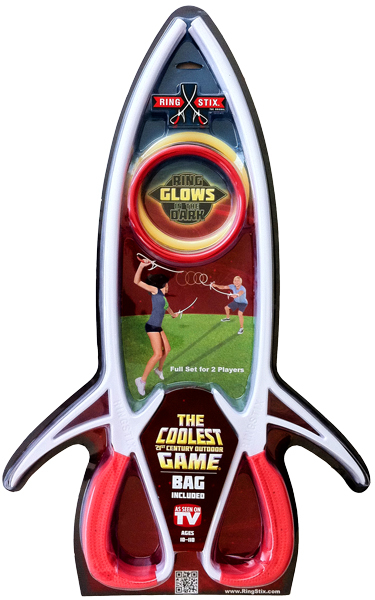 If you have no one to actually play with you, you can launch this high up into the air, and just have a game with yourself. I had a great time doing this. And it only took minutes to figure out. When my husband came home from work, I took him outside right away, and made him play a game with me as well. He and I had so much fun doing this. I really feel like this game is a great game for any time. As well as a great game for family get together's. I also like that because it doesn't take much room, you can just throw it in your trunk of your car, and bring it with you anywhere. The beach and parks. I will definitely be spending alot of time playing with this with my nieces and nephews at our next get together! You can find more about RingStix here.